In 1971 we had 7 million fewer inhabitants in the UK and 15 million fewer cars. Petrol was 7 new pence a litre, Margaret Thatcher the then Secretary of State for Education had been accused of steeling the free school milk (in fact Harold Wilson did this in 1968 by stopping milk for secondary school pupils) , inflation was out of control, peaking at 26.9% in 1975, the trade unions were fighting with the Government throughout the 1970’s leading to strikes, the three day week in 1974 and the winter of discontent in 1978. The 1970’s were not all about the the long hot summer of ’76, space hoppers, chopper bikes, opal fruits, marathan bars, Fine Fair shops and Green Shield stamp books, the 70’s were a decade of decline, in 1972 we produced 2 million cars and by the end of the decade under a million were rolling off the production lines due to cheap imports,outdated factories and a disillusioned workforce. If you were disabled, and lucky enough, you were offered an ice blue single seater that though loved in many quarters, was frequently ridiculed. The Thundersley Invacar Model 70 three wheeler was designed by AC, the same company that gave us the AC Cobra, and was in production from 1971 until 1978, it was three metres (9 foot 9 inches) in length and 1 metre 37cm (4 foot 6 inches) wide. The ice blue fiberglass shell with twin sliding doors offered room for a driver and their wheelchair (folded up beside them) storage was in the front of the car, as the engine was in the boot, which offered room for your shopping and there was also a parcel shelf behind the driver for additional storage. The Thundersley 70 was able to be adapted to the individuals needs depending on their disability, an astonishing 56 different setups were available, you could choose from a traditional steering wheel or a motorcycle style handlebar operation or the ingenious tiller system that when pushed down applied the brakes. The Model 70 had a 493cc Steyr-Puch flat-twin engine that produced 19.3 horse power that could reach a top speed of 60 miles per hour, some models housed a 600cc engine that produced considerably more power and a claimed top speed of 82 miles per hour. The Salsbury transmission pulley drive system offered a forward or reverse option, the gear lever being in the centre of the car with the options Forward, Neutral and Reverse, the downside to this system was that the Invacar could travel as fast in reverse gear as it could going forward. As the Thundersley Invacar Model 70 was owned by the Government, and leased to the drivers, when in 2003 they decided they were not fit to be on the roads of the UK they simply rounded them all up and destroyed them, apparently 50 units a week were going to the crusher, and very few still survive. 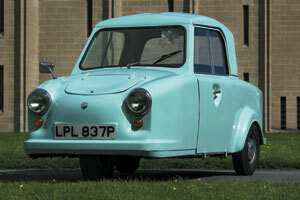 Older Invacar models were not part of the cull and can be registered for use on the UK roads. I am sure we all have memories of the Invacar, mine is mostly of them lining up at the end of the football pitch and a huge cheer going up every time they were hit by an errant shot on goal. apparently In 1978 an AA man was called out by the police to recover two Invacars whose drivers had been pulled over on the M5 motorway. Both Invacars overtook the police car earlier at a speed of 70mph or more.